Justifying our position and stature in the industry, we have come up with a huge collection of Solar Home Lighting System. 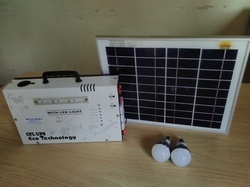 Appreciated for their fine finish and high functionality, these offered Solar Home Lighting Systems are highly demanded. Available with us in a variety of sizes and specifications, we offer modification facility for this range to deliver them to our customers together with attaining their trust. 3W LED Bulb 20 Hours. 5W LED Bulb 15 Hours. 3W LED Bulb Mini Fan 8 Hours. 3W LED Bulb 5W LED Bulb Mini Fan 5 Hours. Power Unit: Powder Coated Steel sheet made enclosures for long-lasting casing life. Can be mounted on the wall, placed on floors / any platform/shelf, Can be carried by hand. Smart & real-time Displays/indications for usage condition, Charging condition, Battery Condition, and also fault condition (Overloads). Complete Protection from the Short circuit, Overload, Battery over charge & deep Discharge. Low resistance Special Copper Cable with Connector. It is completely safe & pollution free. Since it works at 12VDC; it is completely free from electric shock. Extremely easy to mount, easy to maintain & easy to use. Smart looking design, Lightweight & very Handy. If required you can take it with you to Picnic. Extremely economic & Zero running cost. Fully Protected from Short-circuit, Overload, overcharging & undercharging. Hybrid Design. Therefore can be charged with associated Solar plate or household electricity supply. Always stand by you for your need of Lighting, Mobile charging, Fan & Music (Optional). Mobile phone Charger: Mobile Phone Charging point. High-efficiency Solar panel; constructed for Indian conditions. Robust Quality, Reliable Performance, and Tension free warranty. Power Unit with Battery warranty-1 year. Packaging Details: Immediately on Payment receipt. 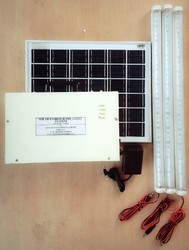 We are offering Solar Home Light to our client.